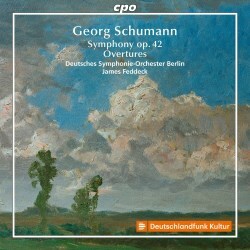 Until this CD came along for review, I'd never heard of the German composer Georg Schumann. I was surprised to discover that this is the fifth volume released by CPO of his music, the others being devoted to orchestral (including the B minor Symphony - review), chamber, lieder and piano works. Schumann was the brother of the organist and composer Camillo Schumann, and he received early music tuition from his father and grandfather. Between 1882-1888 he studied at the Leipzig Conservatory with Carl Reinecke, and it was during this time that he encountered such notables as Liszt, Brahms, Mahler and Bruch. He won early recognition for his B minor Symphony, a student work from 1886, described by one reviewer as "the Sixth Symphony Mendelssohn might have written had he lived". It won first prize in a competition out of fifty-seven entries. Two years later, as he was winding up his studies, he wrote Amor und Psyche, Op. 3 for soloists, choir and orchestra to enthusiastic acclaim. Thereafter, Schumann worked as a choral conductor, and acted as director of the Sing Akademie in Berlin for half a century from 1900. He was also an accomplished pianist, and travelled extensively with his piano trio giving concerts.